Get to know the city in a new way with a self-guided tour from our arts editor. The colorful mural at Fruitvale BART Station is king of the urban jungle. There is a crucial difference between spotting a mural on the way to work and seeking it out for the sake of artistic appreciation. Wandering around with the sole purpose of viewing the art that brings Oakland's cityscape to life morphs The Town into a vibrant urban museum curated by the artists lost inside it. I recently spent a full day visiting many of those artistic gems hidden in plain view — no graffiti-hunting adventure, just a casual tour. Here's one way you can do it, too. Begin in North Oakland at what was formerly The Pallet Space (6510 San Pablo Ave.) to pay homage to Punks Thugs and Vandals (PTV), the crew most widely recognized by the iconic squid-like mugs painted by street artist GATS that elaborately fill the side of the building. On the entrance, a gang of handkerchief-faced rebels by Logo crowd around one of Yenta's apathetic female figures. Next, head south down San Pablo Avenue until you meet Adeline Street, where one of Joey Colombo's gentle giants will greet you in an embellished coat and headdress, adjacent to an old wall of Aaron De La Cruz's intuitive patterns. Hop back onto Adeline and pay attention when passing 34th Street to peep a bright pink fence by some local "Girl Mobb" bosses, Lizzie and Nina. The pursed lips and pink ski mask are difficult to miss. 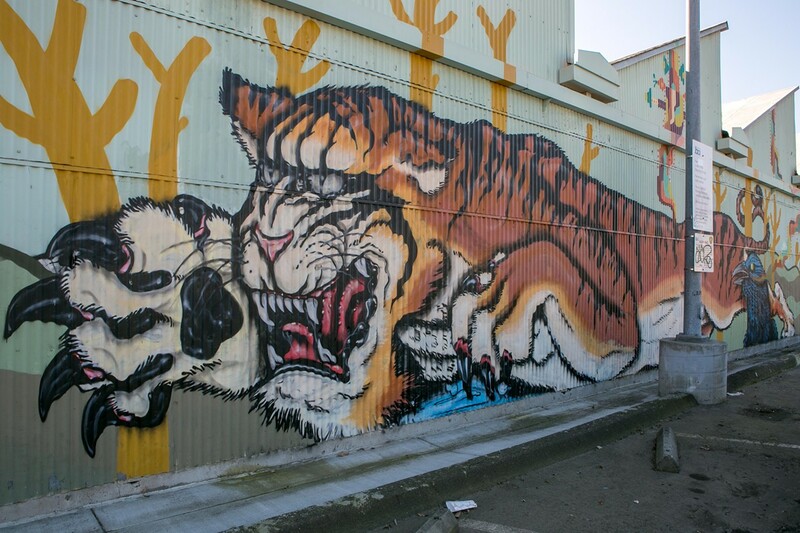 As you head further into West Oakland, swing by 24th Street and Mandela Parkway to see a rowdy gang of monsters hanging out behind Buchanan Auto Shop, impressively thought up and executed by Ernest Doty, Griffin One, and Skinner. Deeper west, the piece by Vogue and Bam of TDK on 16th and Peralta streets can't be missed. One side of the massive building is emblazoned with a long railcar — complete with tags — and on the other side a gigantic ship arrives in the Oakland port during a dramatic sunset. Nearby on 17th and Peralta streets you will find a whimsical wall by local artists Joshua Mays, Santos Shelton, and David Polka. Polka and Shelton's distinct styles of geometric manipulation form a complex landscape that surrounds a futuristic goddess by Mays. Next, head to Uptown into a mecca of murals. The Oakland Palestine Solidarity mural on 26th Street between Telegraph Avenue and Broadway nearly spans an entire block, planting a row of painted trees ripe with cultural and political imagery. The massive collaboration was finished late last year, and brings together the work of ten artists, including Nidal El Khairy, Emory Douglas, Deadeyes, Susan Greene, and Dina Matar. If you duck inside the courtyard of Classic Cars West on the same street, the collaborative styles of Thomas Christopher Haag, Polka, Doty, ANEMAL, and ROAR come together in an otherworldly scene featuring a quilted goat overlooking a tangle of lettering. On the facing wall, intricately drawn birds by Cannon Dill anchor a collaborative piece with Eon 75 and Doty that wraps around the windows of the building. And just through the back door onto 25th Street, three mystical magi by Doty, Polka, and Haag await. Continue to downtown's Thomas L. Berkley Way off Telegraph Avenue for the expansive new mural by Max Kauffman that covers the old PG&E building. Usually a small-scale watercolor painter, Kauffman's soft, expressionist rendering of flowers and birds translates as refreshingly gentle on the wall. Proceed to Webster Street between 15th and 17th streets to find a full block of murals surrounding LeQuiVive Gallery, which organized them and many others in the area. Austrian street artist Nychos offers up a favorite with his huge floating rabbit split down the center to reveal its insides in a cartoony style. Others include the wild and colorful work of San Francisco street artist Zio Ziegler, a Native American chief by IROT, and lettering exclaiming "Packrat's Paradise." You could spend a whole afternoon appreciating the wealth of murals in this area, but the tour must continue. Next, head east. As you make your way down International Boulevard, keep your eyes peeled for the multitude of murals that wallpaper this part of the city with a diverse range of styles. But your destination is Solano Way between 17th and 18th avenues. This tight alley is known for being a treasure trove of public paintings, representing an array of local talent curated by artist Chris Granillo. Some imagery includes Peskador's purple profile of John Coltrane and VYAL's disintegrating eyeball amid abstract waves. When you're finished, continue east to the Fruitvale BART Station parking lot. There you'll find a remarkably long landscape by Doty, Polka, Evan Wilson, Brett Flanigan, and French artist Koleo. 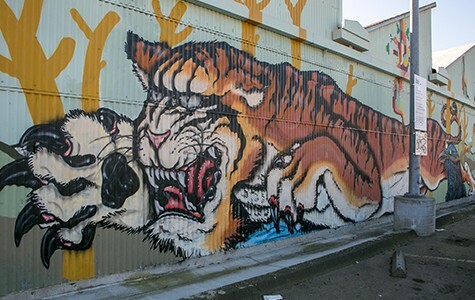 Doty's signature illustrious and colorful birds perch along the wall while Wilson's ferocious tiger pounces off the wall. Flanigan's rainbow composites of amorphous shapes flow along the top, amassing in the center as a large, multi-colored wolf. Polka provides rolling hills, trees, and cityscapes filled in with bold patterning. And Koleo's signature, long-limbed neon figures run and cartwheel across the entirety. Finally, if you've still got it in you, head toward the water into Jingletown to see the largest mural in Oakland at the White Elephant sale warehouse (333 Lancaster Street). A collaboration between Vogue TDK, Doty (he is ubiquitous, it's true), and Griffin One, this zoological piece is an epically large feat. It shows a majestic white elephant marching down the freeway, emerging from a forest filled with birds. By this time, you might get the idea that, despite Oakland's seeming lack of wildlife, sometimes it can look a lot like a zoo ­­— or a fairytale — as long as you're willing to look.